I've been trying to get a view of the total interior of the Y to see where the "other" 5 people will sit, and in what? All I can see is an image of the front seat area from an open passenger door. Is there a detailed interior seating plan or view somewhere? Some people might not put too much value on a 6 year guarantee from Tesla Motors. Those who are out of warranty appear to be largely out of luck. I dunno. I get free labor is nice, but is that how a company with $45 billion market cap should be delivering cars. Is this a sustainable model? And more importantly, should it be? Stock down another 3 points in pre-market while overall markets are positive, so guessing investors don't think so. Electric-car maker Tesla (NASDAQ:TSLA) is asking workers to help find more volunteers to deliver 30,000 vehicles during the last two weeks of the quarter, according to Business Insider. Are we seeing the early edges of the end of the Elon’s car biz? While I appreciate the tech, the inability of an owner to be able to use the car to drive, say, from the Florida coast to escape a hurricane, or to visit family a state away, limits my interest. Independent repair shops, ready , willing - Yes. Tesla selling repair parts to same ? - Yes and No. Tesla links all parts sales, no matter how insignificant, to a specific car - Example " Rich Rebuilds " of you tube fame wanted to buy lug nut covers for one of his Tesla's and Tesla is questioning why he needs them , vin number of car etc. High voltage system parts - good luck to any CA state licenced auto repair shop Tesla is not going to sell parts like this to " non Tesla technicians " with the reason of " safety "
Having a stock of spares? a Tesla no-no, all parts sales are linked to a specific vehicle. Software ? A very very big deal . Think Tesla is going to play ball on this one ?. Parts prices to an independent shop when the sale is approved. Try full retail to the shop who will then need to add normal mark up. Some of Tesla's way of doing business is contrary to so called " Right to repair " laws IMO. Fighting them would be a huge battle. Ouch!! This gives competitors a leg up on pricing vs. Tesla. As part of its new budget, the Canadian federal government has announced a new $5,000 incentive for electric cars that cost less than $45,000, however, it excludes Tesla vehicles. The $45,000 cut off point covers vehicles like the Nissan Leaf, Chevy Bolt EV, and Hyundai Ioniq Electric, but all of Tesla’s vehicles are excluded since the base Model 3 starts at $47,000 CAD. I was watching this morning the heads talk about Elons tweets and the SEC going to the judge and saying that she needs to do something about them as he is not following her order..
With continued strong sales of the Model 3 and without any real competition over the next year or two, the Model Y should continue to drive Tesla's EV dominance. TSLA stock has been recently driven down by turbulent headlines and those who do not understand this market advantage. A great time to buy before the next rise. The ModelY is only a prototype, so who knows what the final vehicle will be. As example, they advertise as 5 or 7 passenger but have never shown what the interior of 7 passenger looks like. There are also no specs I've seen on length, width, etc. More turbulence ahead IMHO. Model 3 sales may disappoint. SEC still actively pursuing Musk for his child like behavior, and Musk has put judge overseeing that case into a corner that may not be good for Musk. Heavy cost to ramp up production for ModelY, will be interesting to see how Tesla funds that. Heck, they don't even know where they'll build it. And news that Tesla vehicles won't qualify for incentives in Canada are just things we know that isn't good news. I'm placing my bet that there is more bad news ahead and more than offsets any more good news that Tesla continues to manufacture. But that said, we know one Fan Boy bought at $293 as that was what he thought near bottom was. You a buyer at today's price? The seven passenger has two small seats jammed in the back. I would say big enough for children or petite adults. This is an option, however. I think most will opt for the 5-seat version and use the back for cargo. Not really a mystery as to size and specs; this is a mid-size SUV built on a Model 3 drive train. 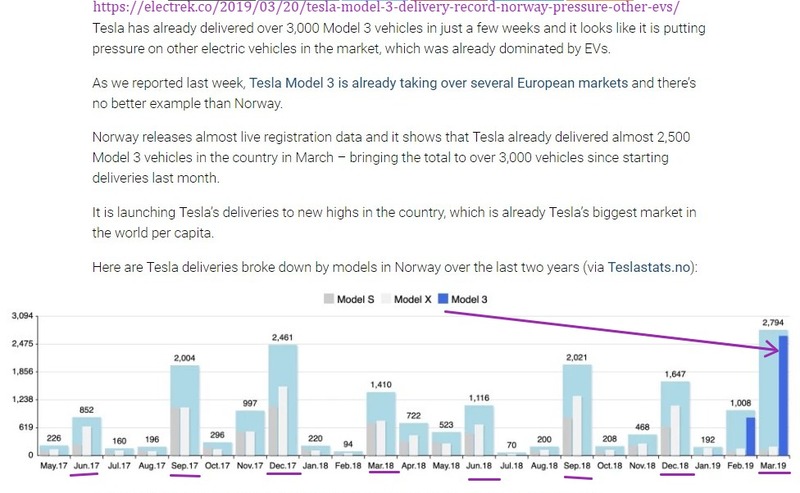 If you believe Bloomberg, Tesla is cranking out more Model 3's than ever before (close to 6,000 per week). Many of those are shipping globally, and can't really be tracked with any precision, yet. Once the global sales are factored in, sales numbers should be fine. 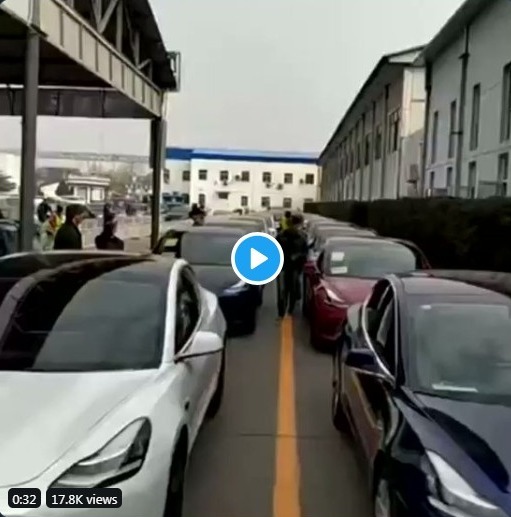 The China plant is one likely source for the Model Y build. It is already funded with loans. Nevada is the other likely build point. I don't think anyone, seriously, doubts that Tesla will find the money to get that production line going. I may have to wait a few weeks before getting my profit on the $293 trade. I should have wait a little longer. I underestimated the ability of Tesla critics to read failure into so much success. It will come back up, soon enough, as calmer heads prevail. A rumble seat (American English), dicky seat, dickie seat or dickey seat (British English), also called a mother-in-law seat, is an upholstered exterior seat which folded into the rear of a coach, carriage,"
My bold above....you mean like a typical sedan? Plus, throwing stats out against already built and sold EV cars while the Y is nothing more than a sketch on a piece of paper is misleading, to be nice here. Skip that production line job in Fremont, go on a European vacation, delivering cars this spring. Is that the Elon plan? , all on Elon's dime. Tesla now has the new German automation company (Grohmann) that helped redesign some TM3 automation. Past experience with a very very similar car will be advantageous. Tesla will be building the Y at the GigaFactory1 site where the batteries are made. China is building the 3 and the Y at GigaFactory3 and they build factories at a higher speed than most places in the world. Various places to watch the progress of the GF3 site. Lot of sales of the TM3 in China already. 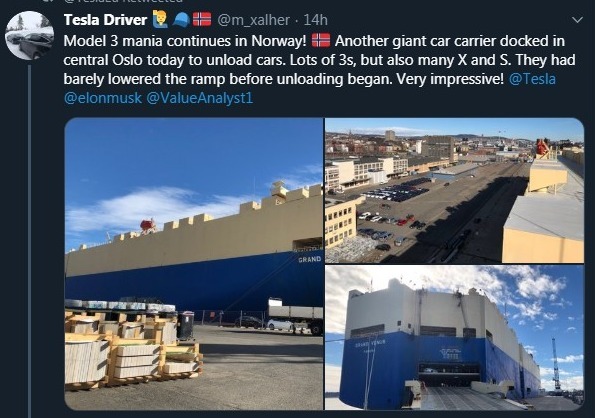 Looks like Norway really like the Tesla Model 3. Looks like another good end quarter set of deliveries. Wonder how well they will like the Y with higher ride/clearance/cargo and the hitch. Re: TM3 sales: Nissan is responding by offering discounted interest rates for the Leaf. For the rest of the month, Nissan is financing the Leaf for just 0.25%. Tesla will be building the Y at the GigaFactory1 site where the batteries are made. I've heard this speculation, but haven't seen any official announcement. Care to share what your source is? Looks like a few "happy times" tweets from fans in the earlier posts are not enough to move investors who might just be looking at fundamentals - TSLA down 1.5% 1.8% 1.99% this AM as I type. As I said earlier, I think Q1 reporting is going to be hard to decipher with the new markets coming on line. That may also spill into Q2. But by the second half, seems we should have a clearer picture of on-going demand. And annual production estimates that are only ~ 10% higher than their Q4 run rates just doesn't sound like the kind of growth that can support this stock price. So much hope for Model Y, but the promise is for late 2020 shipments, and volume isn't expected until 2021. That seems like a long time (1 1/2, maybe 2 years?) to fill out with the current models. Other than happy tweets, do the fans have any fundamentals to justify TSLA as a "buy" at this point (which should now be a roaring buy compared to the higher prices when we were being told that the stock was a great investment)?